Oxford Sports Lawn Tennis Club. North Hinksey Village, Oxford, Oxfordshire, OX2 0NA. We welcome people of all ages and abilities and we support all levels of competitive play for both adults and juniors. 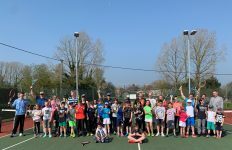 Whether you want to get fit, improve your tennis, play for fun or compete, we have sessions and teams that you can join to achieve your goal and have fun. Founded in 1919, Oxford Sports is one of the oldest tennis clubs in the area. 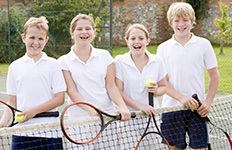 We’re committed to promoting junior and senior tennis and offer an extensive coaching, social and competitive programme. We welcome all new members and provide activities for the whole family. Many of the events from our adult and junior programmes happen at the same time making them perfect for families. Through the week we have social events, club nights, cardio tennis, group coaching and individual coaching. We have community, development and performance coaching programmes for all ages and abilities. The Usual Suspects – But Which Year? New to the game or just feeling out of practice? Rusty Rackets is just for you. The sessions are lead by an LTA qualified coach who will teach you the basics of the game and help you improve. It doesn’t matter how good you are, there is a place for you at Rusty Racquets. Every Tuesday and Thursday night we have Club Night. A great way to meet new people and play some tennis. Come along from 7pm onwards (on your own or with other members) and we will find you somebody to play. We have developed LTA accredited club and advanced programmes which aim to help every child reach their full potential. We run junior tennis camps during most school holidays. Run by a carefully selected team of LTA qualified tennis coaches we aim to provide fun packed days in a safe environment.